On September 30, the Macedonian people were set to have a vote on the name of their country. The referendum, part of the Greco-Macedonian discussions known as the Prespa Agreement, had been planned since June. Tension in the Balkan state was running high just prior to the election, with rallies being held for both sides. Should the referendum pass, Greece would withdraw their objections to the renamed North Macedonian state joining the EU and NATO. As election results began to come in, the numbers were lopsided. Overwhelmingly so. In fact, at the end of vote tallying, 91.5 percent of voters backed the decision to change their name. The problem: Official turnout was only 37 percent. In an unusual tactic in elections, the opposition to the ballot measure simply refused to participate. Officially, the referendum was a formalized public opinion poll regarding the name change, and more broadly, EU and NATO accession. However, politicians in the Macedonian legislature had promised to abide by the vote, assuming turnout was greater than 50 percent. Greece claims that Macedonia is appropriating the name of its northern countryside, an area which produced one of Greece’s icons, Alexander the Great. But some Macedonians disagree, finding a distinction between the region and the postcommunist state. 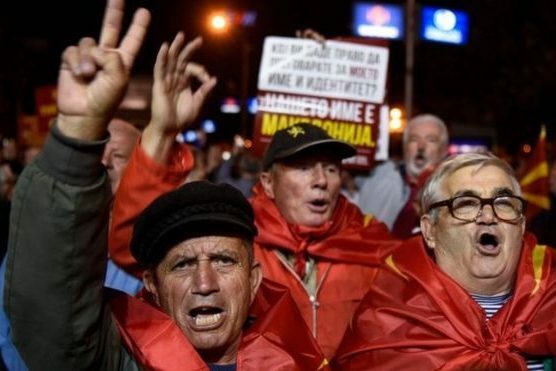 Some have claimed that responsibility lies with Macedonia’s Albanian population, who has historically been pro-EU and turned out in high numbers, but reports show that Albanian turnout was consistent with the numbers from last year’s local elections. Instead, it is likely that a combination of governmental error and overconfidence on the ‘YES’ side produced an insurmountable hurdle. Macedonia has not had a census in nearly twenty years, and a combination of flawed voter registration numbers and general emigration led to a vastly inflated number of registered voters. If the government properly surveyed its population, some say, then the referendum may have passed even in spite of a nearly nonexistent ‘NO’ turnout. Additionally, ‘YES’ advocates failed to respond to the #bojkotiram Twitter movement, which became a coordinated effort to reduce voter turnout. Voter mobilization effort could have been increased and some of the negative effects of low turnout would have been mitigated. Macedonia last tried to join NATO in 2008, when Greece vetoed its membership application. The same is true for the EU; Athens has held out since 1991, when disputes regarding the name first emerged. It is hard to distinguish about how much of the referendum is based on cultural heritage instead of the European Union. Eastern Europe has long suffered from pessimism regarding the success of liberal institutions such as the EU and NATO, and the rise of nationalism has brought renewed effort to leave supranational agreements. “It is clear that the agreement with Greece has not received the green light from the people,” said Hristiajn Mickoski, leader of the opposition VMRO-DPMNE party. Mickoski’s party controls 49 seats in Parliament, comprising just over a third of the 120-member body. This means that the VMRO-DPMNE can nix any possible constitutional amendment to change the name. United States, NATO, and EU administration all praised the vote for its overwhelming show of support for Western ideals while failing to mention low turnout. Previously, leaders such as German President Angela Merkel and US Secretary of Defense James Mattis visited the country to urge support for the passage of the referendum. Zaev has threatened to call for a snap election to replace Parliament with a potentially more EU-friendly one. But that could be a politically-unwise move. The current president Gjeorge Ivanov was allied with VMRO-DPMNE, and the party is fired up after Mickoski said that Zaev had “lost his legitimacy.” In addition, should Zaev’s party emerge from elections with a majority, which is far from certain, there is no guarantee that his new Parliament will hold the two-thirds majority necessary to implement a change to Macedonia’s name. Ultimately, EU accession would benefit the small country. Entrance into the common market would bolster the economy and joining NATO would solidly rebuff any possibility of Russian advances into Macedonia’s fragile political scene. But like much of Eastern Europe, its people are skeptical of the Western focus of the EU. The see the EU as a great leveler, wrenching power away from the local people, much like the Soviet Union did for the majority of the 20th century. Whether those fears are founded is of no matter; Macedonians are divided on the subject and at least for now, that means no name change.